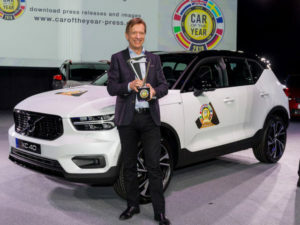 The Volvo XC40 has taken the European Car of the Year 2018 award, fending off runners-up including the Seat Ibiza and BMW 5 Series. The XC40 took the 2018 European Car of the Year title from a list of seven finalists. Announced at the Geneva Motor Show, the XC40 was awarded 325 points, putting it in the top spot, from a jury consisting of 60 members from 23 European countries. The Seat Ibiza (242 points) was second among the seven finalists, followed by the BMW 5 Series (226 points), Kia Stinger (204), Citroën C3 Aircross (171), Audi A8 (169) and Alfa Romeo Stelvio (163).